Your cold cooperation is violation. Photo courtesy of Matt Morrison. Found at Korean Air desk in Hong Kong. 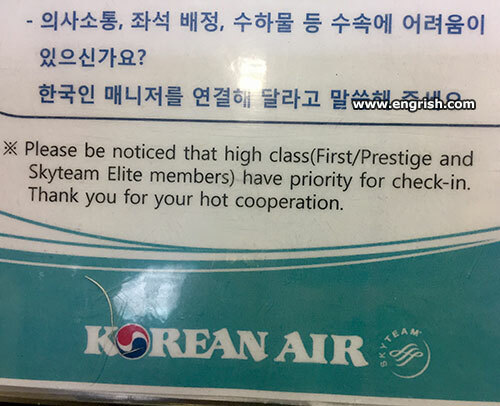 Mile High club members have priority too? That figures…I usually have a hard time getting noticed when flying cattle class. I’m willing to provide hot cooperation if I get hot service from the stewardesses. 50 shades of economy class peasant. Punish me business class, I like it. How do you know they’re high class passengers. Well they haven’t got s%!t on their backs. Did you notice my finger? My cooperation was made by Samsung. You sure you want it that hot?